La Brea made photographic history. With the help of German photo-grapher Bernd Becher, the photograph was shown at documenta 6 in Kassel, Germany, as early as 1977. It was also printed in Sally Eauclaire‘s survey The New Color Photography, which was published in 1981 and which helped American color photography achieve its international break-through. The following year, La Brea appeared in Shore‘s photobook Uncommon Places. Thereafter, the photograph began exerting a long-terminfluence as a result, among other things, of Becher‘s work as a teacher at the art academy in Düsseldorf. 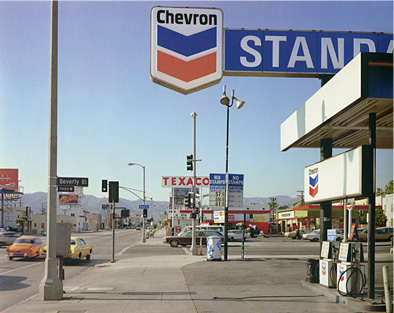 Thomas Struth, Thomas Ruff, Andreas Gursky and other renowned art photographers of the Becher school have all acknowledged the influence of Stephen Shore. Throughout the world, La Brea has been included in textbooks and surveys of photography. It has become part of the canon and of the collective memory of photography. Christy Lange recently analyzed the deep impact the picture has had even on younger photographers. “In 1975, he photographed an intersection in Los Angeles that I know well, at the corner of Beverly Boulevard and La Brea Avenue. Though he took his picture two years before I was born, and none of the stores that appear in it remain today, it is still immediately recognizable to me. This is partly because everything in the photograph, from the stray hose in the immediate foreground to the ‘Walk’ signal in the middle ground, to the houses on the hillside (one of them my parents’ home), are in equal sharp focus.” Christy Lange is not alone in believing that La Brea marks a new concept of landscape imagery, “one in which the details themselves – their density and abundance, rather than the entirety – were intended to be the focal point or subject. Each image is so sharp...” If we are to follow in Stephen Shore‘s footsteps, then we must make photography more complex, see it clearly, and rethink it.